Comal is a popular dining spot adjacent to Berkeley's campus. It accommodates groups of all sizes, and people can choose whether to sit inside or on the beautiful wooden, outdoor patio complete with a fire pit. The menu for this Mexican restaurant goes beyond what one would find in one of the nearby taquerías. The full bar celebrates a variety of tequíla and mezcal themed cocktails, as well as some fruity and seasonal agua fresca beverages. Using chips as our vessel, we started off trying the guacamole and three house-made salsas. Another verdant dip that we tried was the sikil pak, which is a purée of grilled eggplant and habanero topped with toasted pumpkin seeds. Spanish in style, we also tried the papas fritas (i.e. french fries) sprinkles with coriander-lime salt and served with a chipotle aoili. 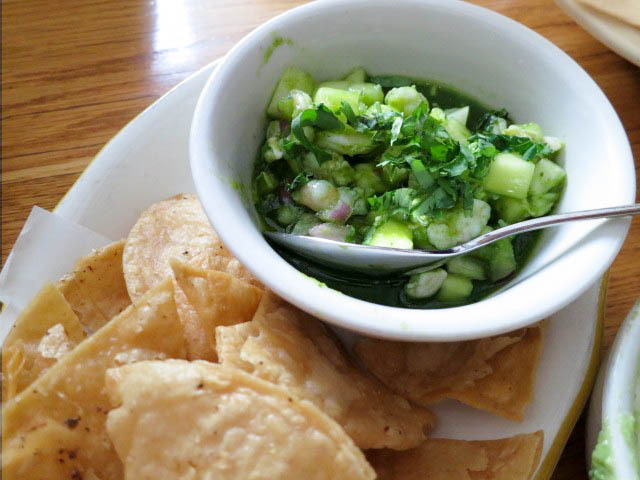 For our last appetizer, we shared the shrimp ceviche with aguachile verde, red oinion, and jicama. Comal's dishes are extremely "chip friendly", so if you are looking for a less fried option, it would be best to stay away from most of the appetizers. For our main course we each had a taco, made in a hand-shaped, soft, corn tortilla. The wood-grilled rock cod filling was topped with a spicy pickled cabbage and radish slaw. For dessert, we shared a creamy and custard-like flan topped with candied strawberries. These modern interpretations of Mexican cuisine celebrate the coastal regions surrounding Oaxaca. The chef pays careful attention to the locally sourced ingredients, which inspires the seasonally changing menu, making Comal worth revisiting.